Woeha! is the only certified professional dog walker for Wageningen and Bennekom. Mondays to Fridays Woeha! offers exercise and companionship for your dog. Woeha! 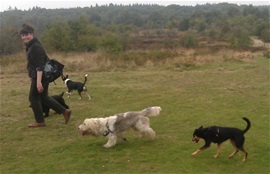 walks take place in the afternoon, in a group of about 7 dogs in a large off-leash area in Bennekom. The walks last for two hours and are a good choice if your dog has lots of energy to spend or requires extra hours of company. Woeha! lets your dog be a dog, in a safe and responsible way. The car Woeha! uses is completely costumized to safety and comfort for your dog. Just to be sure Woeha! will provide your dog with a tag engraved with our telephone number. A first aid kit is also standard equipment. All socialized dogs are welcome to join. On fixed days of the week, on alternating days, every day or only once a month, almost all scenarios are possible! Interested? Do nose around on this website and feel free to contact me!